This is Part 2 of a 3 part series. 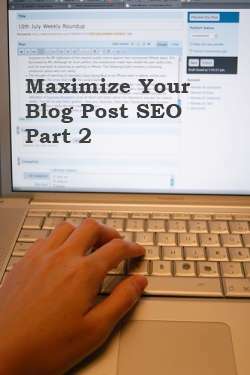 Part 1 talked about the Functional Aspects of Optimizing Your Blog and Part 3 will talk about Linking Strategies for Your Blog Posts This post is about the technical aspects of optimizing your blog posts for SEO. The phrases that I’ll use for blogging refer to working with a WordPress blog but you can adapt this to any other blogging you’re doing. The technical aspects of blogging are important and not being a technical person doesn’t have to get in the way of thriving at the technical side. There are many technical items in the architecture and the setup of your blog that help with Search Engine Optimization but we’re going to focus on the ones that you have to worry about for each of your blog posts. In order to take full advantage of updating the technical elements of your blog, you’ll need a good SEO plugin that makes editing the following tags easy when you’re posting. For visual effect below is an example of how this post will be displayed in Google’s search results. This is important to note because we’re not just optimizing for search engines, we’re also optimizing for <gasp!> humans! Yes, what we show here will display in the search results of Google so make sure it’s something someone will want to click on, which is what this is all about. This includes the Title tag (green), Description tag (red), and the URL (blue). This is one of the most important aspects of your technical optimization for both humans and search engines. You’re given a line to describe your post and include good keywords relevant to your post. Usually I suggest the title of the post (read the functional optimization) followed by the name of your site. The description tag is an often looked over tag when compared to it’s big, successful, and much more popular older sibling the title tag. Don’t overlook this tag, however. Creating a good description tag can help highlight more keywords that users are searching for, give them a good idea of what they will be reading, and can include a call to action that gets them to click on your link. Write this to be captivating to a user and include keywords as they will be highlighted in the search results just like the title tag. The URL or “web address” of your post. So overlooked, abused, and misunderstood. This small part of your blog post can provide great insight into your post, it can help a user realize where they are on your site (hierarchy), and it can sometimes help with Search Engine Optimization by including some keywords and having those highlighted in search results. I would, however, just focus on the user aspect. Some people use a format of <domain name>/<category>/<post title> for their URLs and you’ll see that mine is setup that way. I do, however, suggest having your format <domain name>/<post title> to create shorter URLs that are easier to read. I only keep my URL structure because you shouldn’t change your structure if you’ve been around for awhile and it’s not that bad. With the technical aspects of optimizing your blog posts, be especially careful about not partaking in “keyword stuffing” or anything that could be construed as “web spam”. Our intentions with these optimization techniques are to make it easier for the search engines to catalog and know what our content is about and, most importantly, let users easily find and know what our content is about.